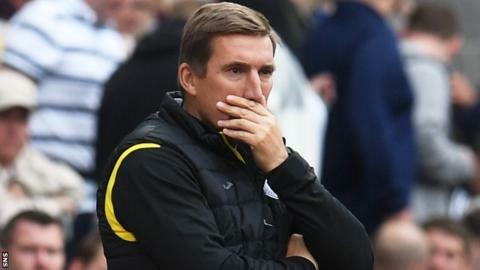 For St Mirren to sack Alan Stubbs less than three months after appointing him as manager, it shows the concern at the squad assembled by the Englishman. That's the opinion of BBC Scotland pundit Steven Thompson, the former Scotland striker who lifted the Scottish League Cup with the Buddies during a five-year spell. "Gordon Scott (the St Mirren chairman) acted very quickly when he sacked Alex Rae to replace him with Jack Ross, but Alex Rae was the previous board's appointment," he points out. "This is his own appointment. For him not to stand by him, or show the patience to let it develop, tells me that he is extremely worried about where the team are." Stubbs, who previously managed Hibernian and Rotherham United, took over from Ross when the Scot moved to Sunderland after leading St Mirren to the Scottish Championship title and promotion. But the former Bolton Wanderers, Celtic and Everton defender lasted four weeks less than the four months he spent at Rotherham before being dismissed with his side second bottom of the table. "I have a lot of sympathy for the coaching staff that will leave St Mirren because they've not really been given a lot of time to get things right," Thompson says. "Four games into the season, they have one win. They've played away to Hearts and away to Rangers, arguably two of their hardest fixtures. "They also went out the League Cup, but again that was away to Aberdeen - an extremely difficult game. "The supporters were exceptionally negative after Livingston won in Paisley. I can understand that. "But, four games in, they aren't sitting bottom of the league. They are only two points off the middle of the table and I don't think it was quite panic stations yet." St Mirren lost two key figures this summer. In addition to their up-and-coming manager, they had sold their star player, winger Lewis Morgan, to Celtic in January. And, although he returned on loan to help the Paisley side win promotion, Stubbs was left looking for a replacement. "Obviously losing a player of Lewis Morgan's quality is going to have an impact on the squad," said Thompson. "You don't know the circumstances of whether funds were available. But, from the outside looking in, the recruitment probably hasn't been good enough." Where do St Mirren go from here? "If Gordon Scott thinks he got the Alan Stubbs decision wrong, and he clearly does because he sacked him, this is a decision the board will take a lot of time and thought over," Thompson says. "I think the board will come together today or tomorrow and get a shortlist drawn up. "They have managed to do it at a time when they have a free weekend because of international games. "So it gives them the opportunity to take the next few days to make the appointment and get the right man in place for a working week starting on Monday. "I don't think there will be a shortage of people interested because it is a very good job. St Mirren are a club with fantastic facilities and a great support. "With the window closing, barring players that are on a free, whoever comes in is going to have to work with who is there and won't really be able to strengthen the squad. "It is a big opportunity. If you do manage to keep St Mirren in the league, it would be a really strong achievement." Who is likely to take over as manager? Former St Mirren midfielder Jim Goodwin, who led Alloa Athletic to promotion from League One last season, Gus MacPherson, who had a seven-year spell as Buddies boss and is now head coach with Queen's Park in League Two, and Jim McIntyre, who was sacked by Ross County a year ago, are among those being touted for the job. "My old team-mate, Jim Goodwin, is doing a great job at Alloa - a St Mirren legend, former cup-winning captain," Thompson says. "Jim brings a level of inexperience, but he's probably in a similar mould to what Jack Ross was like. The one thing about Jim Goodwin is that he is a born leader - and a winner. "So I think he would be a great appointment, but the other two would be good appointments as well."